It's that time of year again! Test your knowledge of the world's largest folk festival and see what you know. 1. Where does the world-famous Oktoberfest take place? 2. In what year did the first Oktoberfest take place? 3. What did the first Oktoberfest celebrate? 4. What was the main attraction at the first Oktoberfest celebration? 5. When does Oktoberfest begin each year? 6. 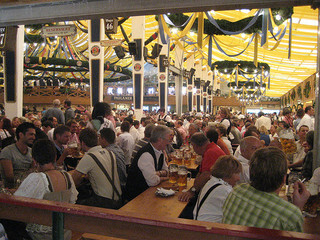 What is the first scheduled event at Oktoberfest each year? 7. Who is in charge of tapping the festival’s first beer keg each year? 8. Beer is served in a standard-sized mug called a “Maß”. How much beer does it hold? 9. What is the name of the town square where the Oktoberfest takes place? 10. Approximately how many people visit Oktoberfest each year? We’re having an Oktoberfest party and I want to use the quiz but I need the answers! I am organising Oktoberfest and I want to use quiz. how do I get the answers please?